Have you noticed how mainstream media dismisses Charlie Sheen as a sad example of a Hollywood star on the slide? And have you noticed those same media outlets devote tons of ink and hours of airtime to each and every pronouncement by Sheen, promoting for free what he cares about? This is not a comment on the actor's morals, choices, companions, or hairstyle. 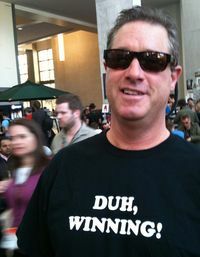 It is a comment on his marketing and PR savvy. Charlie Sheen says what he thinks when the time is right for him using the tools of self-publishing and social networking. He tweets, he produces videos, and he owns search results. And the media report his every move in real-time. In short, Charlie Sheen is doing exactly what I've been talking about for nearly a decade. He publishes interesting and valuable information that people want to consume and that they are eager to share with their friends. Sheen seems to be having a blast. And while he tends to rant and overuse words in the way my university friends did (and some still do), it seems clear to me that he knows exactly what he’s doing -- and as a result, he is winning the communications game. 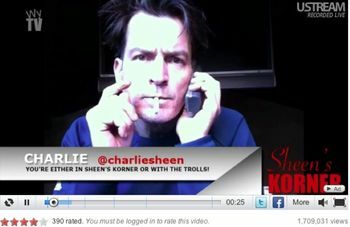 Now Charlie Sheen is taking his act on the road with his Violent Torpedo of Truth / Defeat is Not an Option Show. So far 20 dates are booked. Guess what? He doesn't need to spend a penny to promote the tour! Nearly 1,000 media outlets happily do that for him at no cost. The media say: "Poor Charlie Sheen... He’s so sad... Oh, and he's doing a tour." Ha! Who is winning here? Sheen! The media is plugging his tour every minute of every day. Yes, I'm going to catch the Boston show. The guy is a marketing & PR superstar and I want to be in the room to hear him live. UPDATE March 23, 2011 - Three of the first five Charlie Sheen live shows are sold out at prices of about $75 a ticket.